Orchestra, ensemble of musical instruments; in the narrowest sense, the characteristic ensemble of Western music, having as its core a group of bowed stringed instruments of the violin family, augmented by woodwind, brass, and percussion instruments. Orchestra can also refer to various specialised ensembles, such as a balalaika orchestra, a jazz orchestra, or a gamelan (the tuned-percussion orchestra used in Indonesian Music). The word orchestra originally signified the section in ancient Greek theatres between the stage and the audience that was used by dancers and instrumentalists. In a modern theatre the part of the auditorium reserved for musicians is called the orchestra pit. The string section, which forms the backbone of orchestral sound, is divided into five parts: first violins, second violins, violas, cellos, and double basses. The double basses sometimes duplicate the cello part an octave lower, but often the music calls for an independent bass part. 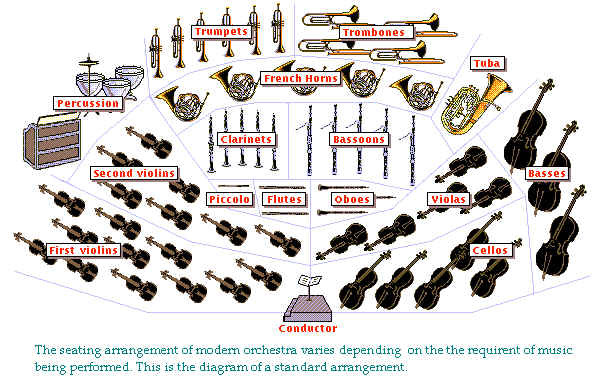 The number of players in a modern orchestra can vary from about two dozen or fewer to well over 100. Of these, the woodwind and brass sections each constitute about 10 to 20 per cent of the orchestra, and the percussion about 10 per cent. For the strings, certain proportions have proved to give the most effective balance of sound; an orchestra with 20 first violins is likely to have about 18 to 20 second violins, 14 violas, 12 cellos, and 8 double basses; these numbers may vary, but they are considered representative. The woodwind and brass sections, unlike the strings, normally have only one player per part. Until the mid-19th century, the woodwind section consisted of two flutes, two oboes, two clarinets, and two bassoons (a formation known as double wind); the two members of each pair played different musical parts. By the late 19th century three of each instrument was common (triple wind), with the third player sometimes switching to a related instrument (for example, Cor Anglais, piccolo, double bassoon, bass clarinet). The brass section, in its fully developed form, typically consists of four horns, three trumpets, three trombones, and a tuba. These are sometimes augmented by other brass instruments, such as the bass trombone or the Wagner tuba designed by the German composer Richard Wagner and used in his scores. The percussion section, in addition to one player who plays only the timpani, has traditionally emloyed one or two players, each of whom covers several instruments. The basic percussion group up to the mid-19th century consisted of a side drum (snare drum), a bass drum, cymbals, and a triangle. In the 20th century, however, works employing ten or more players and dozens of different instruments have become common, while the total number of percussion instruments in use has grown into the hundreds. In addition to these four groups (bowed string, woodwind, brass, and percussion), most orchestras also have a harp and a piano. The seating of the orchestra is determined by the conductor, who directs the orchestra in performance. The first and second violins are usually placed to the left of the conductor, the violas, cellos, and basses to the right (a common variation is for the first and second violins to face each other on opposite sides of the conductor). The woodwind and brass are in front of the conductor but behind the strings, and the percussion are placed farthest back. Opera and ballet orchestras share with symphony orchestras the size and structure described above; they differ in their ancestry and function. The symphony orchestra performs symphonies, concertos, and other concert music and is normally placed on a stage. Opera and ballet orchestras are part of theatrical performances and are seated in the orchestra pit of a theatre (a space in front of and partly underneath the stage). A chamber orchestra is one consisting usually of 25 or fewer players. Virtually all orchestras before 1800 were of this size, and many 20th-century composers call for chamber orchestras. A string orchestra, which may be of chamber-orchestra size or may be quite large, consists of the standard orchestral string section, with no added wind or percussion instruments. The development and standardisation of the modern orchestra took place between about 1600 and about 1750. In the first major opera, Orfeo (1607), the Italian composer Claudio Monteverdi used an orchestra having a central string section augmented by other instruments and bound together harmonically by basso continuo (bass melody instrument, such as cello or bassoon, plus harmonic support from harpsichord or organ). During the 1600s, orchestras became common not only in opera performances but as ensembles maintained by aristocratic families for private concerts. By the early 18th century the combination of first and second violins, violas, cellos, and double basses had become standard for the strings; and a pair of oboes or flutes or both and a bassoon were usually added. A harpsichord or an organ normally supplied chords for the basso continuo part. The newly invented clarinet was added to the orchestra about the middle of the 18th century, and pairs of flutes, oboes, clarinets, and bassoons became common. The coiled hunting horn also entered the orchestra, used to evoke an atmosphere of the hunt and to give added volume and richness. Trumpets and timpani, previously the prerogative of the nobility, were sometimes used when an opera or cantata text alluded to royalty; later, trumpets were added for brilliance. Trombones, used for centuries in church music and municipal bands, entered the opera orchestra in the late 18th century and the symphony orchestra in the early 19th century. In the late 18th century the basso continuo fell out of use and the keyboard instruments dropped out. A vogue for imitating Turkish military music introduced the triangle, cymbals, and bass drum. The tuba entered the orchestra only in the 19th century, a result of technological experimenting with brass instruments. Its predecessors had been the serpent (an S-shaped wooden horn with fingerholes) and the ophicleide (keyed bass bugle). Until the late 18th century, orchestras tended to have 20-30 members. During the lifetime of Ludwig van Beethoven the size increased to 30 to 40 players. As 19th-century composers sought new, dramatic ways to express themselves in music, orchestras became larger and by the early 20th century about 100 players was considered optimal.